Shopping for a Toyota Corolla just got easier. 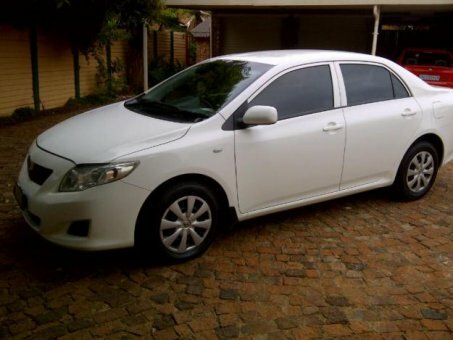 Take for example the 2008 White Toyota Corolla now available for Repokar Toyota Corolla fans. This model is in excellent condition and is nicely equipped. With just about 30,000 miles on it, many Laconia Toyota Corolla shoppers would say that this car is barely used. Because Toyotas can go for hundreds of thousands of miles with the right care, the buyer of this car will enjoy driving their Corolla for years to come. The 2008 Toyota Corolla is also recognized for holding its value. If all you want is an economy car with a long history of reliability, it's an excellent choice. Simple, strong value-for-money is at the root of the 2008 Corolla's appeal, which has extremely low ownership costs, according to Toyota, due to its high reliability, fuel efficiency, and resale value. However Corolla doesn't skimp on ride and refinement. Especially when optioned with available safety equipment, the small sedan should fit the needs of commuters and young families on a budget. The 126-horsepower, 1.8L four-cylinder engine that powers all Corollas has variable valve timing with intelligence, which helps give it good response through the rev range without hampering fuel efficiency. With the manual transmission, the Corolla can accelerate from zero to 60 mph in just under nine seconds, according to Toyota, yet it achieves EPA fuel economy ratings of 28 mpg city, 35 mpg highway.